A Feather board without ambition is a Feather board without FeatherWings! This is the DC Motor + Stepper FeatherWing which will let you use 2 x bi-polar stepper motors or 4 x brushed DC motorx (or 1 stepper and 2 DC motors). Using our Feather Stacking Headers or Feather Female Headers you can connect a FeatherWing on top or bottom of your Feather board and let the board take flight! 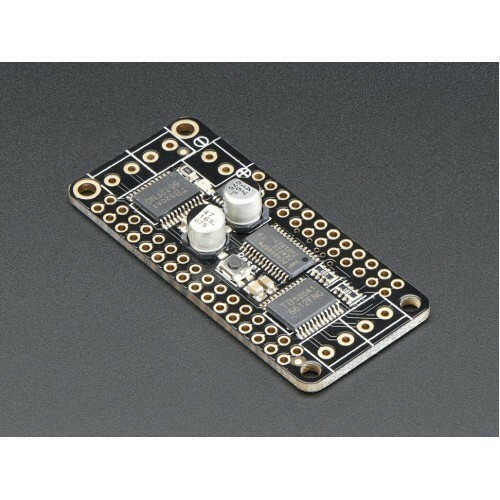 The original Adafruit Motorshield Kit is one of our most beloved kits, which is why we decided to squish it all together on a FeatherWing to make something even smaller, lighter, and more portable! Instead of using a latch and the Arduino's PWM pins, we have a fully-dedicated PWM driver chip onboard. This chip handles all the motor and speed controls over I2C. 4 full H-Bridges: the TB6612 chipset provides 1.2A per bridge (3A peak) with thermal shutdown protection, internal kickback protection diodes. Can run motors on 4.5VDC to 13.5VDC. Completely stackable design: 5 address-select jumper pads means up to 32 stackable wings: that's 64 steppers or 128 DC motors! What on earth could you do with that many steppers? I have no idea but if you come up with something send us a photo because that would be a pretty glorious project. Comes with an assembled & tested FeatherWing, terminal blocks & plain header. Some soldering is required to assemble the headers on. Stacking headers not included, but we sell them in the shop so if you want to stack shields, please pick them up at the same time.Feather and motors are not included but we have lots of motors in the shop. You can use any DC or stepper motors that run from 4.5-13.5VDC and draw under 1.2A (3A peak) per coil. You'll likely also need to provide some external power supply for your motors, since its not suggested you run motors from the Feather's lipoly battery.